The emblems of ten Thai political parties can be found at this page. All emblems and two more on a page in Thai language at the Thai Parliament Official Website. As far as I could find out the extra emblems have filenames "thai" (Thai party) and "thai-sa" (Thai Democratic Party). I understand these are simply emblems not flags. Actually some contain the Thai flag itself. The National United Front of Democracy Against Dictatorship (UDD) is the anti-People's Alliance for Democracy (PAD) (http://en.wikipedia.org/wiki/People%27s_Alliance_for_Democracy) political pressure group in Thailand, and are commonly called Red Shirts. The UDD claims that Abhisit Vejjajiva, current Prime Minister of the Democrat Party, took power 'illegitimately', backed by the Thai Army and the judiciary. 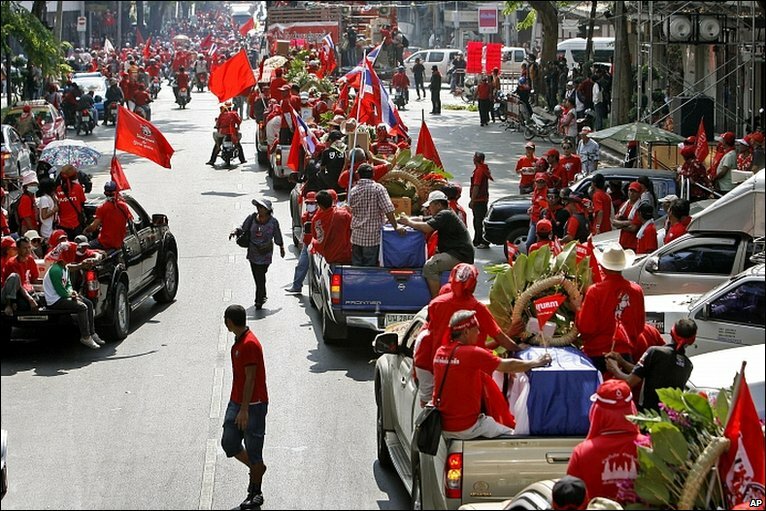 It calls for the Thai Parliament to be dissolved so that a general re-election can be held. The UDD allies itself with the For Thais Party (http://en.wikipedia.org/wiki/For_Thais_Party) (itself successor of the Thai Rak Thai party which was banned after the 2006 elections) . They accuse the country's elite - the military, judiciary, certain members of the Privy Council, and other unelected officials - of undermining democracy by interfering in politics. 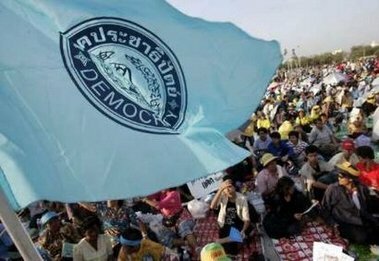 The UDD is composed of both rural and urban supporters, and although the movement receives support from former Prime Minister Thaksin Shinawatra, not all UDD members support the deposed Prime Minister. The movement was established in 2006. Thai Rak Thai ("Thai Love Thai") is the current Thai ruling party. It serves as the personal electoral vehicle of PM Thaksin Shinawatra and recently won a landslide victory in Parliamentary elections. Its flag features the centered party logo over its name in white on a bright red field. It should be noted that, for uses other than the flag, the party logo is usually red-and-blue. Thai Rak (of ex-premier Thaksin Sinawatra) is described as plain blue, but probably must be blue with symbol. Thai Rak used red, blue, yellow and white flags with symbol (sometimes within a white rectangle). Source: Arté 2-4-06 "Les thailandais aiment les thailandais"
Corbic 60 reports the flag of a Thailand party, described only as anti-Shinawatra. It is described as white with a symbol in center: four hands (color unquoted) forming a rectangle, and within a white colombe on black. I speculate that might be the Solidarity party. Democratic party flag is described as yellow with gold, black-lined charge (Corbic believes it to be the royal crown). That may be a variant or an official version; the party commonly uses a light blue flag with the party seal in a darker blue – see photo. The woman kneeling is http://en.wikipedia.org/wiki/Phra_Mae_Thorani. Cannot make out the legend beneath the image. The motto is visible on the logo on the Democrat Party (Thailand) Facebook page: it is a proverb in ancient language that amounts to a vow to never die. The flag or the anti-CNS (Council for National Security – more information at Wikipedia). This 2006 anti-coup flag's obverse and reverse are different colors, based on many pictures from Thai newspapers. Thailand United Southern Underground announced a ceasefire yesterday. Their flag was shown on the TV news. Apparently a Muslim insurgent group in southern Thailand, "Tai Ruam Pak Tai Khong Prathet."